This November, Korhan Erel will be playing six concerts with cellist/bandmate Gülşah Erol in the Soundtrips concert series curated by Simon Camatta, Gunda Gottschalk, Erhard Hirt, Paul Hubweber, Carl Ludwig Hübsch, and Martin Blume. In each concert, there will be guest musicians joining the duo. Following Soundtrips, Erel and Erol will play three concerts with Gunnar Lettow, Hamburg-based prepared e-bass player. These concerts will be an extended trio version of the Lettow / Erel duo that started in 2011. 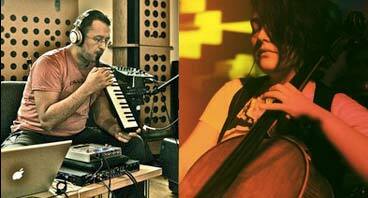 Previously Lettow and Erel played concerts in Istanbul, Hamburg, Hannover and Berlin. The last concert of Erel’s tour in Germany will be with cellist Tristan Honsinger and sax player Dario Fariello. Fariello and Erel had collaborated in diverse settings in Istanbul in the past. This will be a reunion after a three-year break. This entry was posted in News, Performances and tagged aachen, Berlin, Bochum, cello, cologne, computer, controller, dario fariello, electroacoustic, electronic music, Erhard Hirt, Fabian Jung, free, Free Improvisation, freedom, Gülşah Erol, Germany, Gunnar Lettow, Hamburg, Hannover, Istanbul, Joana Sa, köln, Martin Blume, Martin Theurer, Matthias Muche, münster, music, nicolas wiese, non-idiomatic, Paul Lytton, quiet cue, Simon Camatta, tristan honsinger, witten, wuppertal, zeitzone. Bookmark the permalink.